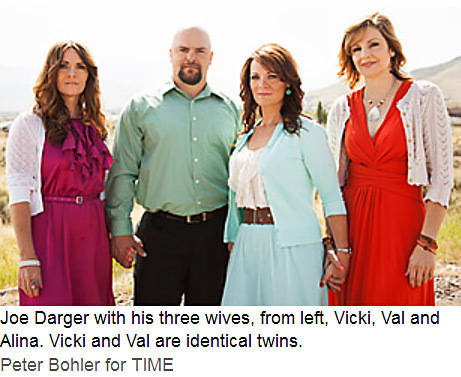 The current issue of Time magazine (dated August 6th) features a four-page, 2,500-word article about Mormon polygamists seeking recognition, focusing on the Joe Darger family in Utah. It also goes out of its way to tell about the increasingly visible polyamory movement. Though unfortunately, it sometimes intermixes the two. For the poly sections, I was pleased to see that the writer may have taken leads from this website. I could be imagining it... but how many other sources have publicized the claim (by people who say they were there) that when members of the Kerista commune invented the word "compersion," they were using a Ouija board? So far, Time has put only a seven-paragraph teaser publicly online (including a video of the Dargers and their school-bus-size load of children). The article is only in the paper magazine or online for paper-magazine subscribers. Why once secretive plural families like the Dargers of Utah are coming out of the shadows and beginning to advocate for their way of life. Close observers of the marital topography are noticing a shift in attitudes toward polygamy and its sister wife, polyamory, which can roughly be defined as having multiple lovers by mutual agreement. Partly this is a result of a decades-long wholesale rethinking of the institution of marriage and who society and the courts say can engage in it. But it's also a result of more exposure to polygamous lifestyles. Some polygamists, sensing unsteadiness in the big ship monogamy that has always blocked their passage to the oceans of normality, are trying to navigate their way to validation of their version of family. In 2010 the Columbia Law Review, taking into account both fundamentalist Mormons and the growing number of Muslim immigrants, estimated that 30,000 to 100,000 U.S. families practice plural marriage. Deborah Anapol, author of Polyamory in the 21st Century, puts the percentage of polyamorists at 0.5% to 3.5% of the population [which would mean about 1 to 8 million U.S. adults]. That's a guess, but there are signs the figure is growing. Polyamorous groups report upticks in the number of local chapters and attendance at their meetings, conferences and marches. In May the American Psychiatric Association included a forum on polyamory at its annual meeting. Nonmonogamists are becoming increasingly vocal in defending their lifestyle. How fringe can a cultural practice be, after all, when it's part of the family history of both of this year's presidential candidates? Across the country, just outside Boston, the Dargers have an ally of sorts in Thomas Amoroso. An emergency physician, Amoroso has a live-in girlfriend, Katherine, who has a live-in husband, Matt. (Amoroso also has another girlfriend.) [We know them. Sparkle Moose and I brought food to the housewarming potluck for their new house last year, along with a big crowd of other Poly Boston people that totally jammed the place.] They don't seek attention, but they're not averse to it. "We routinely walk down the sidewalk hand in hand in hand," says Matt, although he and Katherine would prefer that their last name not be made public. The trio, who got together at a science-fiction convention (polyamorists are often fans of the works of Robert Heinlein [see my article! ]), have tried to mimic marriage as much as they can. They've bought a house together. They are one another's health care proxies. Matt and Katherine are trying to have a baby, and Amoroso is looking forward to co-parenting. "If we lived in a society that permitted plural marriage, it's something I'd think about," says Matt. "But we live together, we support each other, we spend time together, so I've got the stuff I want." Amoroso and Darger don't know each other, and there's not much else they'd agree on, but they're brothers in arms in the fight against what they see as a monogamy monopoly. Amoroso served on the board of the Alternatives to Marriage Project, and he speaks at conventions about his living arrangement. "Our lives are much the same as other people's," he says. "It's important to me that there's understanding and acceptance." The reaction he gets from most people, including his family and employers, is raised-eyebrow acceptance: "It wouldn't work for me, but if it makes you happy ..."
...Why do some people want multiple life partners when most of us can barely deal with one? Both fundamentalist Mormons and polyamorists argue that having several partners requires people to be more loving and generous and to learn to overcome jealousy. There's a term polyamorists use for enjoying their lover's happiness with another: compersion. (The word is thought by some to have originated in the '80s at a San Francisco commune by people using a Ouija board.) Fundamentalist Mormons believe the practice mirrors the selfless interconnectedness that will exist in heaven. They call it "living the principle." The article then goes on to describe the uglier sides of polygamy among fundamentalist Mormons and other patriarchal societies. Among the key distinctions it fails to make is that while traditional patriarchal polygamy results in gender imbalance and an excess of left-out single men, modern secular polyamory is fiercely egalitarian, often feminist-oriented, and seems to spawn as many MMF households as FFM ones. I think I wish you'd let the Ouija board business vanish into obscurity. Of course it does, Alan, I'd dare say all researchers of this subject who are looking to write an article or create other forms of media do. Heck, a fair number of them find their way to me and I got out of the day-to-day poly media tracking business a very long time ago. Whew, was I delighted to know you had that in hand and so very well. You are indeed a big deal! Well, I agree they handled my family fairly well, and were kind enough to draw the distinction between folks like Joe Darger and us. Nothing against his family-they all appear to be consenting adults-but the statement that there is likely little else we'd agree on is likely correct, given the little I know about them. Hi Alan. Thanks - once again - for being on top of what's floating around out there and sharing it. The one discomfort I'm left with is how the author of the article focused on the male as central and dominant in both examples....polygamy and polyamory. I'm sure this isn't true of the polyamorous folks, but it's left sort of appearing that way. I think that many poly ppl would like official recognition from the civil government. But those who want legal sanction, should realize that it's a double edged sword. given the winds of political change. It wasn't that long ago, that the state used marriage as means to control vast segments of populations, that was bigoted at best, and eugenics at worst. It's entirely conceivable that civil authority could reinstate current marriage laws, maybe even more draconian ones, unless we ask the high court to remove civil authority from all marriages. Before the 1600's if consenting adults chose to live together, they were considered to be married, without interference from civil government. While some will welcome civil approval, I don't need civil or religious authorities to approve who or how many i love and cherish.